Are Americans losing their appetite for assault weapons? Not quite. But the gun buying frenzy that began after the Sandy Hook shooting in 2012 and reached a fever pitch during President Barack Obama’s push to ban assault weapons the following year has finally started to subside. Sales are falling at Smith & Wesson, the second-biggest public gun-maker in the U.S., in large part because people are buying fewer long guns like rifles, the company said this week. Sales at the gun-maker dropped by about 23 percent over the past three months compared to the same period last year. Profits dropped by about 32 percent to $49.1 million. Profits also fell at other big gun manufacturers this year. Colt Manufacturing reported a net loss of over $7 million for the three months ended March 31, 2014, much of it due to declining sales of rifles. Freedom Group, which owns the iconic Remington and Bushmaster brands, is private and doesn't release its figures, but analysts say things there aren't much better. Freedom Group sales for the first quarter of 2014 were down 20.3 percent year over year, said Maksim Soshkin, a defense industry analyst at market research company IBISWorld. Quarterly profits plummeted 31 percent year over year at Sturm, Ruger & Co., the largest publicly traded gun company in the U.S. In a press release late last month, Sturm, Ruger & Co. cited a “reduction in overall industry demand” as the top factor for declining sales. After Adam Lanza carried out the second-deadliest shooting by an individual in U.S. history on Dec. 14, 2012, killing 26 children and adults at Sandy Hook Elementary School, gun sales spiked. Buyers stocked up on weapons, fearing renewed efforts at gun control would limit the availability of different kinds of firearms. The following year saw the highest number of criminal background checks of any year in history, according to data from the FBI. Gun control advocates and the gun industry use the FBI's background check figures as a way to gauge total U.S. gun sales. So far, this year has seen enthusiasm wane. 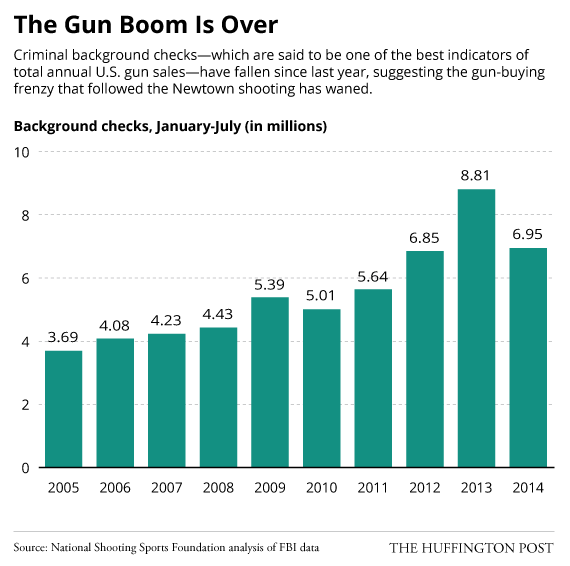 According to the National Shooting Sports Foundation, a trade organization for gun manufacturers based in Newtown, Connecticut, there were significantly fewer background checks completed for gun sales in the first seven months of 2014 (6.95 million) than there were in the first seven months of 2013 (8.81 million). The National Shooting Sports Foundation gets its data from the FBI, which has been tracking background checks since 1998, and then adjusts it so that it doesn’t include “non-sales activity” like checks for concealed carry permits. Now that gun-buying fever is cooling down, sporting rifles are gathering dust on gun store shelves, said Andrea James, an emerging technology analyst with the financial services firm Dougherty and Company LLC. Still, gun sales are just slightly off-peak -- more background checks are being done than every other year besides 2013, according to NSSF’s adjusted FBI data. So why are public gun-makers hurting so badly? Analysts say these brand-name companies are getting undercut by a host of smaller competitors. Sturm, Ruger and Co., in its press release late last month announcing its bad news, named “aggressive discounting” from competitors as a primary reason for declining sales. “Gun distributors have found cheaper manufacturers to buy from,” Brian Ruttenbur, an analyst with CRT Capital, which provides investment advice on firearm manufacturing companies, said. “We don’t know who it is -- because the distributors are private and don’t share this information -- but someone in the market is dumping product into the retail chain." Firearms have become progressively more expensive over the years, said Andrew Molchan, the director of the National Association of Federally Licensed Firearms Dealers. Increasing costs have pushed consumers to buy used guns, which are often just as reliable and durable as new guns, Molchan said. People are also looking more toward discount sellers, he added. “Smith and Wesson has a reputation like Cadillac. Everyone in the world knows who they are. And they’ve always charged a little more as a result,” Molchan said. Gun manufacturers that are based in foreign countries, like Forjas Taurus in southern Brazil, make decent imitation weapons that can be had for 20 to 25 percent less than their American counterparts, he added. Wherever the guns are coming from, Americans aren't showing any signs of letting up on buying firearms. The boom may be over, but the nation is just as passionate as ever about arming itself.